The are many reasons one might put off a much-needed home improvement project. Budget. Can’t find the right contractor. When it came to the tomb where Christians believe Jesus was buried, it was two centuries of infighting between some very possessive monks. The Church of the Holy Sepulcher, located in the Old City of Jerusalem, is considered to be one of the holiest for Christians. The 4th century church is run by three separate religious groups—Roman Catholic, Greek Orthodox, and Armenian Orthodox—which each manages its own interpretive experience within the site. Any major construction work has to be agreed upon by all factions. Which they failed to agree upon—for 200 years. Yes, due to angry monks, there have been no updates to the church since 1810, when repairs were made after a fire. In the two centuries since, as the church deteriorated beneath them, the religious servants who took an oath to serve humankind hadn’t been able to agree upon the changes, resorting to violence in some circumstances: “In 2008, an argument between Greek Orthodox and Armenian monks escalated into a brawl,” according to BBC News. (Which is absolutely true, and this was apparently not the first fistfight over Jesus’ tomb.) But the groups were suddenly inspired to cooperate when Israeli police threatened to close the church, declaring it structurally unsafe. 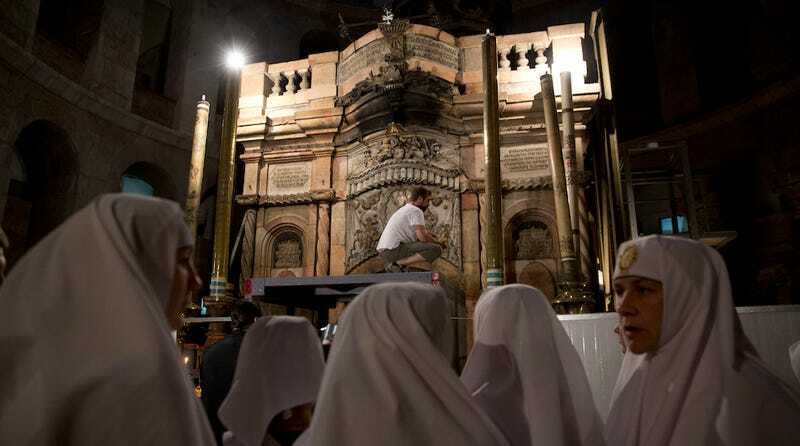 The area most in need of repair is the Edicule, the shrine where Jesus’ tomb is located, which has been ravaged by water damage and candle smoke. The entire structure also needs a seismic upgrade. Each group is chipping in for the $3.3 million project, which will take up to a year, barring some kind of, ahem, divine intervention.